While executive positions in the Nigerian political sphere often witness upheavals with elected officials going through swinging doors, there is a certain level of continuity in the National Assembly. Senators enjoy an unlimited tenure and can keep representing their constituencies insofar they get re-elected every four years. However, getting re-elected these days seems a chore as 42 out of 109 senators will definitely not be returning to the Red Chamber. For a gamut of reasons from contesting other political positions, losing primaries to simply stepping down, here are five senators that will not return for the ninth Senate. The ‘common sense’ evangelist rolled his capitalist sleeves to dip into the political sphere in 2015 when he ran for Senate. Fully entrenched in politics, the Bayelsa-East Senator will not return to the ninth Senate due to a rotational arrangement between the three local governments in the Senatorial district. The People’s Democratic Party Senator stepped down for Honourable Blessing Izagara, however, he is expected to be handed a key role within the presidency if PDP wins the Presidential election. Perhaps for the most squalid reason, Senator Dariye, representing Plateau Central, will also not be returning to the Red Chamber. The former Plateau State governor is currently serving a jail term in Kuje prison, Abuja. The Senator was handed a 14-year and two-year jail sentence on the charges of criminal breach of trust and misappropriation of funds (1.6 billion Naira) respectively while he was the Governor of Plateau state. Although he purchased re-election forms from prison with the hope that he will win his appeal (he didn’t win his appeal) he didn’t win the candidacy to represent his constituency. According to section 107 sub-section 1 (d) of the Nigeria Constitution 1999 as amended, states that no person shall be qualified for election if, within a period of fewer than 10 years before the date of an election, he has been convicted and sentenced for an offence involving dishonesty. After 20 years in the Senate, David Mark will not be returning as the Senate representative for the Benue South Senatorial district. Perhaps, weary of legislating in the Red Chamber, the former Senate President set his eyes on the highest political office in Nigeria. Senator Mark contested the PDP Presidential primaries but lost to Atiku Abubakar. Unlike current Senate President Bukola Saraki, who was also a PDP Presidential aspirant, Mark did not purchase a form for his return to the Senate. Former minister of interior, Abba Morro, replaced him as the PDP candidate for Benue South Senatorial district. Mark will be out of the Senate for the first time since 1999. While Senator Adeleke rode on the coat-tails of his brother’s death in 2017 to become the Osun West Senator, he will not return to the Senate chambers after the 2019 elections. Adeleke unsuccessfully contested the Osun State governorship elections in September 2019. He narrowly lost the rerun election to Gboyega Isiaka of the All Progressives Congress. He is also currently embroiled in an examination malpractice saga. The Police allege that the Senator was impersonated in the National Examination Council’s June/July 2017 Senior School Certificate Examination in February 2017. Two-term Senator, Gbenga Ashafa, will not be returning to the senate after he lost in the Lagos APC primaries to Lagos State House of Assembly member, Bayo Osinowo. Senator Ashafa later claimed he released his unopposed ticket to the leadership of the party. 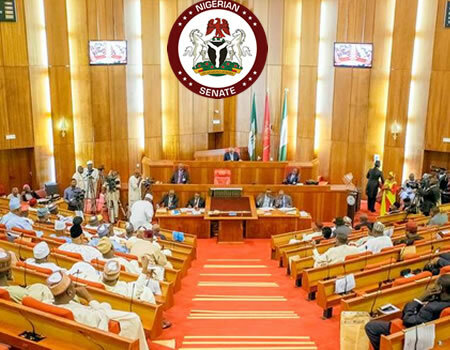 The Chairman of the Senate Joint committee on Land Transport, Marine Transport and Aviation was lauded for moving a motion on the illicit and excessive charges by Nigerian banks, particularly on ATM maintenance and withdrawal charges.